PTF@Weatherhead Annual General Meeting (AGM) Tuesday 9th October at 6pm – all welcome. 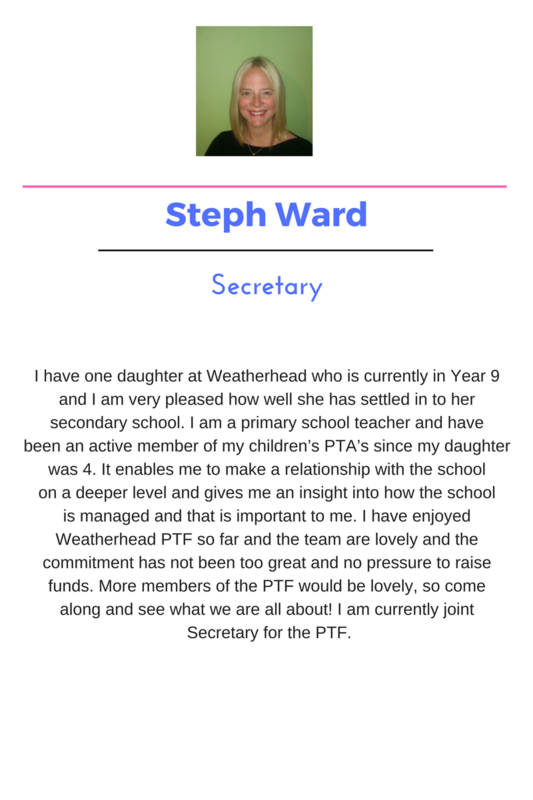 The PTF@Weatherhead meet informally each term to share thoughts on school life and to support or shape events to help the school and families here. Our ideas and fundraising efforts so far have contributed to the behavioural reward scheme IRIS, the Learning Resource Centre, school uniforms, gardening club and most recently to creating a more vibrant outside recreation area. We also seek to champion local initiatives as part of our community role and always seek new ideas and individuals to engage with. The Parents Teachers and Friends @ Weatherhead (PTF) have been busy raising money for the Weatherhead pupils. This is what the PTF have donated to the pupils recently. If you would like more information regarding these donations please contact Suzanne Broster PTF Chair. £100 donated to Wallasey Village in Bloom to create some colourful pots for the street. As parents ourselves, we know how daunting Year 7 can be for new parents and carers as well as the students. A new school like Weatherhead has so many new aspects and we are here to help make sense of it all. We must not forget that the parents and carers of students new to school in Year 12 might need extra support too. The university open days beckon and student finance looms. Some of us have been there already and can be a useful ally! We encourage all new parents and carers to come along to one of our informal meetings. Dates of PTF Meetings are posted on the school calendar and also listed on the weekly Home-School Update. Usually there will be a representative parent from each year group, or if not, someone who has been through that particular year can help. 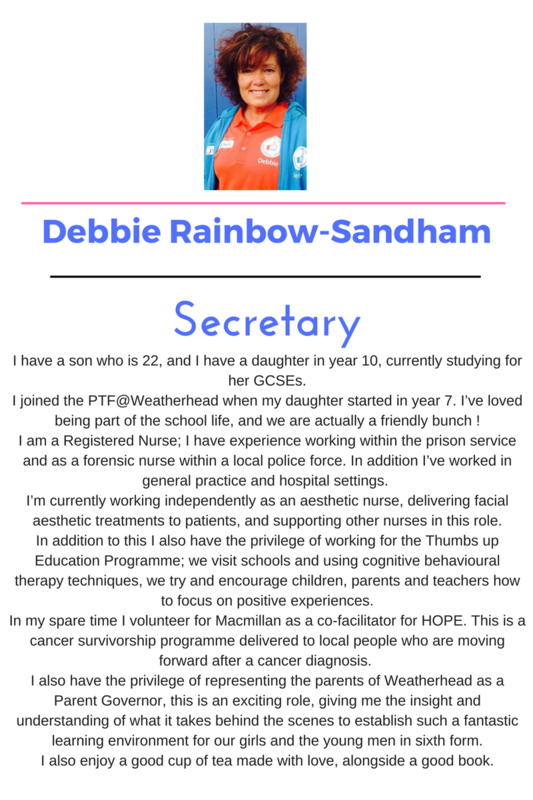 On behalf of the all the parents, teachers and friends at the PTF we would all like to say a huge “thank you”, “good bye” and “good luck” to Michelle who is stepping down as treasurer of the PTF after several years. We would all like to thank Michelle for her hard work and dedication as the treasurer and we hope you enjoy a well earned rest. 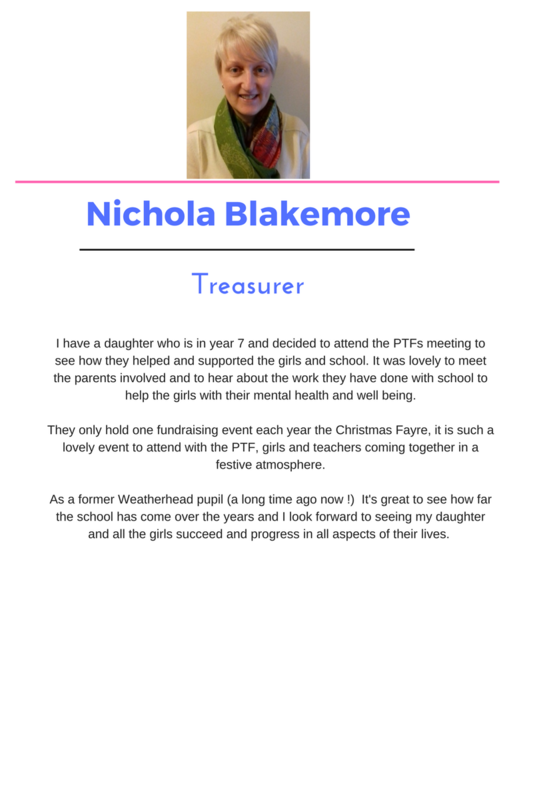 I would like to introduce our new treasurer and member of our team, Nichola Blackmore. 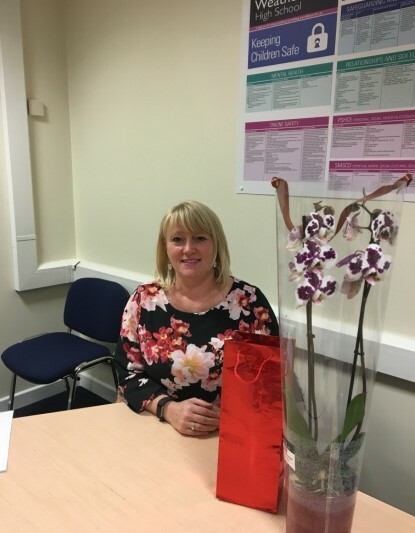 Welcome aboard Nichola! 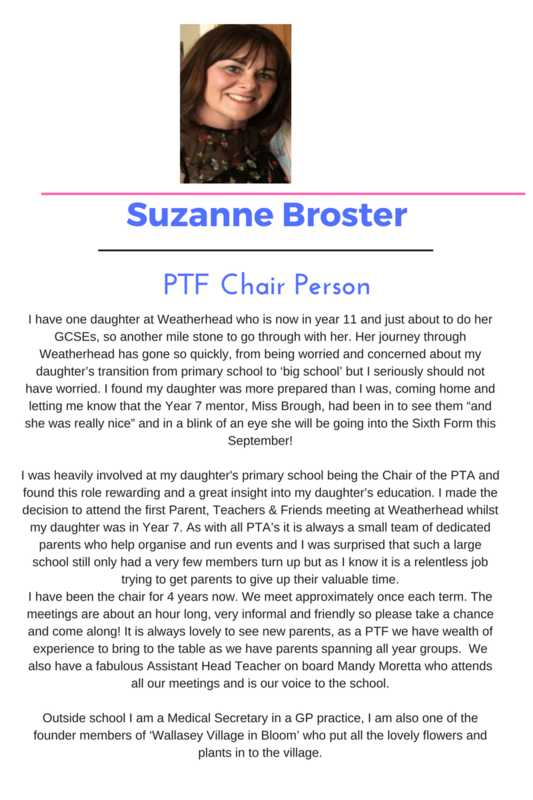 If you are interested in joining the Parents, Teachers and Friends @Weatherhead, or would like to be included in the general PTF emails, please email our PTF Chair, Suzanne Broster: ptf@weatherheadhigh.co.uk.